My daughter is so happy that she can get vacation as the school is going to end first week of June. But as she is attending summer school, her vacation starts only by July first. When she is at home likes to eat little bites, so I make something which contains strawberries which is her favorite. Whereas my hubby likes TRISCUIT as his on the go snack and for that reason TRISCUIT is in my pantry all the time. For a change I made sweet and savory TRISCUIT appetizers. 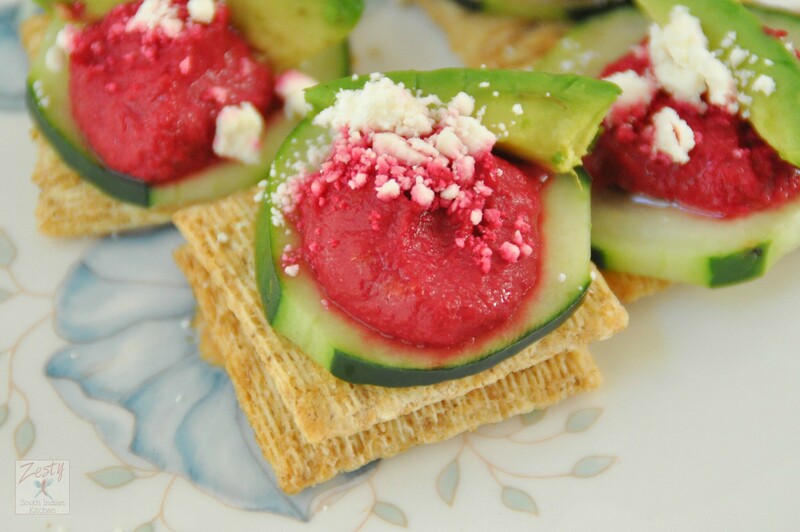 Roasted strawberry cream cheese honey TRISCUIT (Strawberrycreamhoneyscuit) make sweet version where as Beet humus cucumber avocado feta TRISCUIT (Beethummuscucumocadofetascuit) make savory version. As grilling season begins with this Memorial Day weekend, try these TRISCUIT toppings that were made for summer nights. 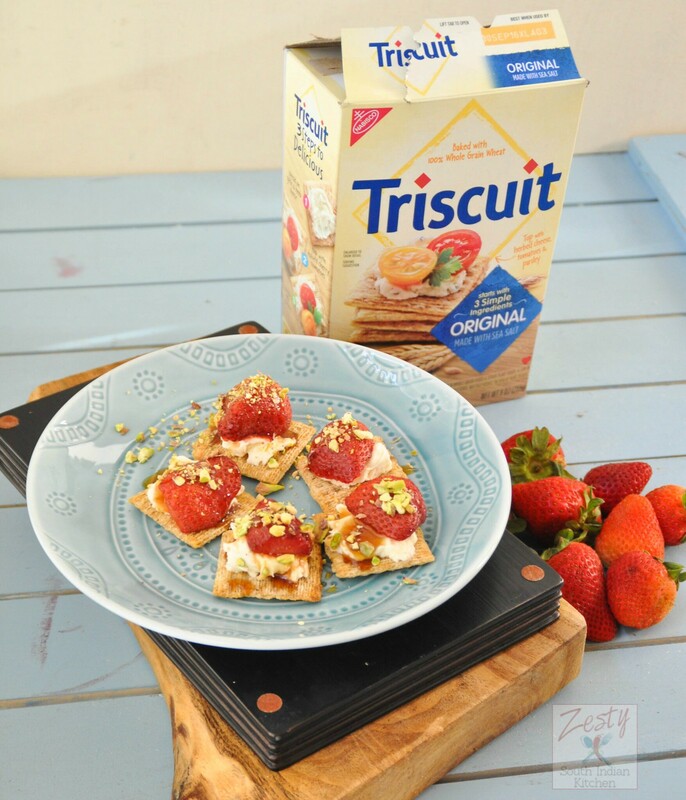 For making these TRISCUIT appetizers you need little planning, yes need to make roasted strawberries and roasted beets for hummus you can find the recipes here. Then grab your favorite TRISCUIT from your neighborhood grocery store Kroger. I like to shop at Kroger as they have lot of fresh produce, cheese and sale on most of items. Beauty of this dish is that it has is lot of flavors going on a single dish, for Beet humus cucumber avocado feta TRISCUIT, I used TRISCUIT Cracked Pepper & Olive Oil. Whereas roasted for strawberry cream cheese honey TRISCUIT, I used TRISCUIT Original. Roasting beets and strawberries are only cooking part, rest is only assembly. Make beet hummus using roasted beets. Once you made hummus start layering the TRISCUIT. 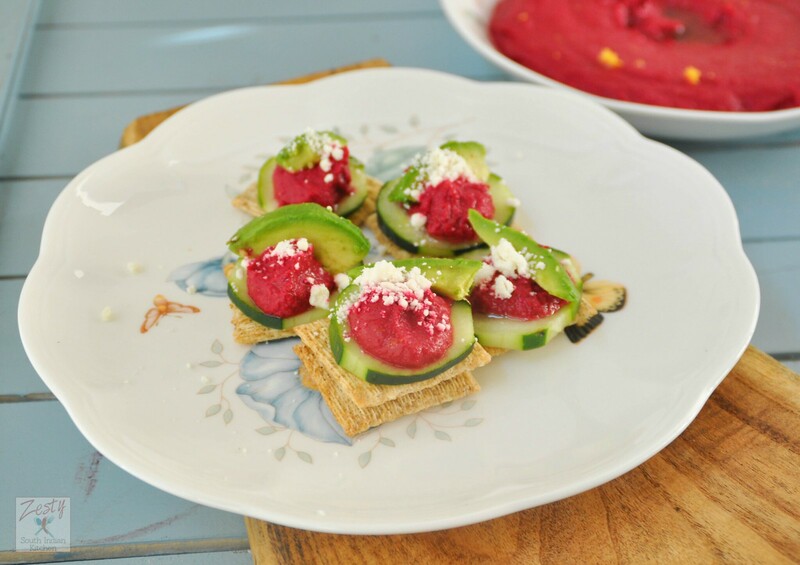 Use TRISCUIT Cracked Pepper & Olive Oil as base and place a cucumber sliced and then add 1-2 teaspoon of beet hummus in the center then top with avocado slice and sprinkle feta cheese. You are going to love them delicious and addictive. 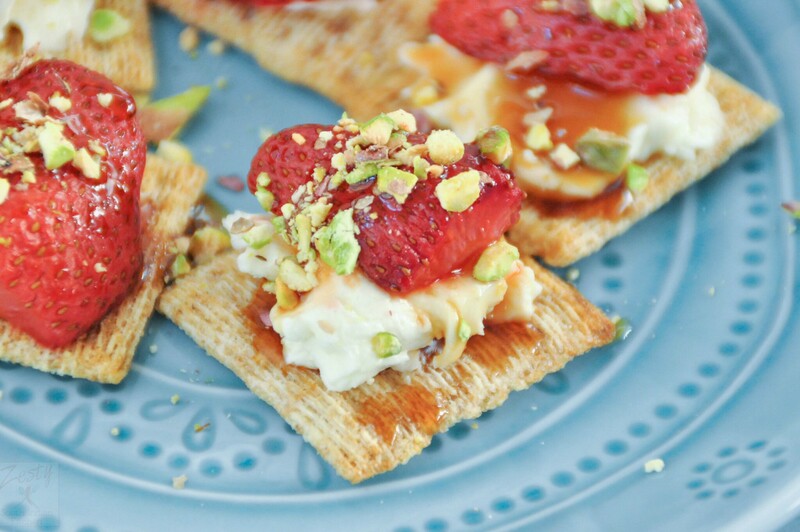 For making Roasted strawberry cream cheese honey TRISCUIT, take one TRISCUIT Original, then place lightly sweetened cream cheese and top with roasted strawberry then drizzle honey and top with crushed pistachios. 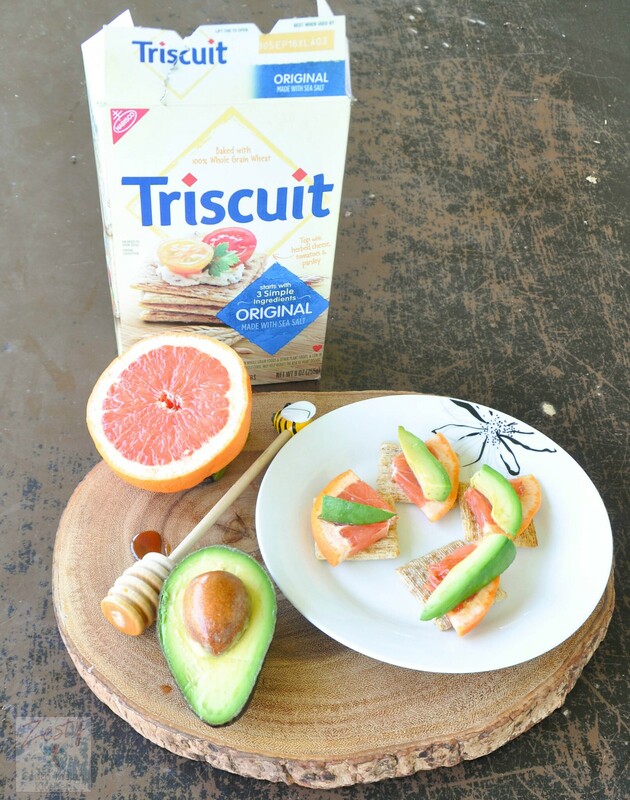 Here is there is another combo you can try with Honeygrapocadoscuit which is made with honey,grapefruit and avocado and TRISCUIT. 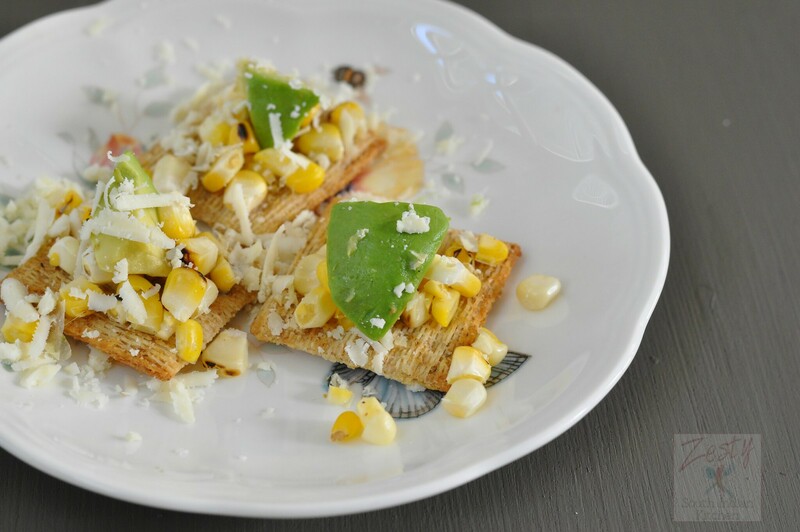 There another one is Cotijacornocadoscuit which is made with cojita cheese ,roasted corn,avocado and TRISCUIT. Who can resist this colorful delicious appetizer? Are you savory or sweet person, just top TRISCUIT Crackers with savory or sweet ingredients, making them the perfect choice for a snack, appetizer or even a meal! If you are hosting a party in your backyard try this treats, your guests will love it. 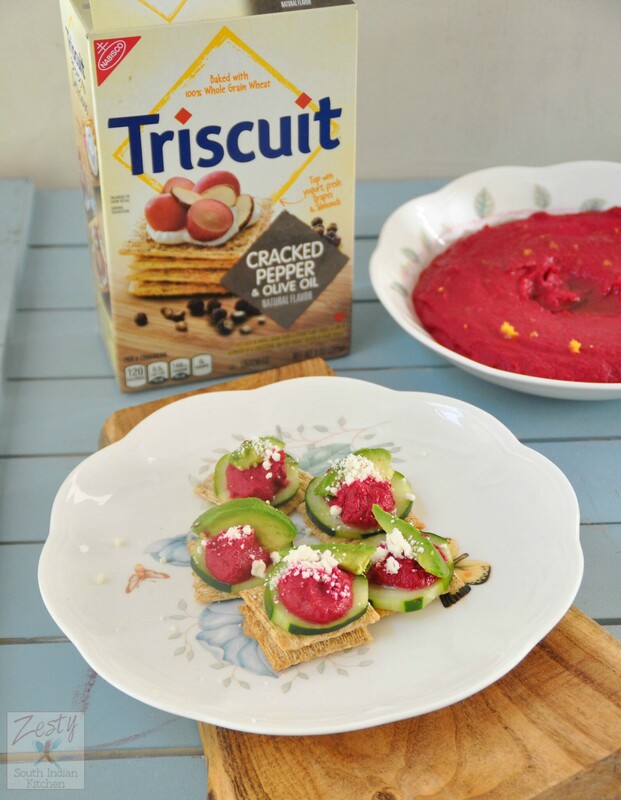 Delicious Sweet and savory appetizer made with TRISCUIT for summer gathering. Little preparation but tasty outcome. Then add washed drained canned chickpeas, garlic, salt, pepper, tahini, lemon juice , olive oil . Process until it is smooth consistency and set aside. First make sweetened cream cheese mixture, in a bowl add soft cream cheese, powdered sugar and vanilla extract and mix well to combine. Then place a roasted strawberry on the top. Then finally sprinkle with some crushed pistachios. Triscuit is one of my favorite. I have tried almost all their flavors. This one with toppings looks so beautiful and YUM! Wonderful treats to enjoy for the summer. OMG this snack has my heart. If I’m putting something on a triscuit this mascarpone strawberry combo is it!! Lovely snacks!! Kids would grab it!! Love the beet hummus,tempting appetizers. These look so delicious! Having a light delicious, appetizer like this at a summer gathering can really kick things into gear! Very nice! Thanks for sharing this cool idea!